Manini’s is a world-class food company that brings healthy and great tasting gluten-free foods to market. At the heart of their commitment to quality is a dedication to making all of their fresh pastas, breads & bakery products from naturally gluten free ancient grains. The result is nutritious, fiber-rich food that is superior in taste, texture and nutrition to the vast majority of typical rice and corn based gluten free foods. Head over to Manini's for more information. 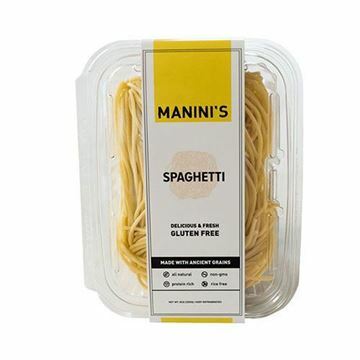 Manini's Gluten Free Spaghetti - 9 oz. Fresh, gluten-free spaghetti made locally in Kent.